China’s is the second largest economy in the world, and the largest contributor to global growth since 2008. Still, China is pushing for further growth and innovation – Chinese spending on research and development now outstrips that in the US. 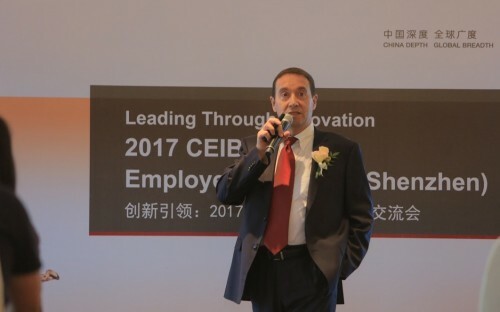 Professor Juan Fernandez, associate dean for China Europe International Business School’s (CEIBS) full-time MBA program, sees the CEIBS MBA as the breeding ground for China’s future, tech-savvy business leaders. The CEIBS MBA is ranked first in Asia and 11th in the world by the Financial Times. In 2016, 100% CEIBS’ international MBA students received job offers in Asia. Juan’s first act as associate dean and director of the MBA program was to introduce a new digital business concentration. BusinessBecause caught up Juan to find out more. Why should MBA applicants choose CEIBS? There are three main reasons why MBAs decide to study at CEIBS. First, is the proximity of CEIBS to the heart of the action in the business world. China is leading the world in digital business, for example, and we are lucky to have such a hive of activity beyond the walls of our Shanghai Campus. Second, is our unmatched understanding of China within a global context. The majority of our faculty were educated abroad and live in Shanghai and conduct research and consult for companies here. In short, they are here for the same reason that I am, they are excited to play their part in the economic development story of our lifetime – China. The third reason is differentiation; students know they will be earning an internationally-recognized top MBA at CEIBS, with the added advantage of valuable China know-how. So, if you envision your resume containing a combination of the following words in the future: China, Global and Digital, then I would recommend you take a closer look at the CEIBS MBA. What do you look for in your MBA applicants? Our MBAs are curious and enthusiastic about business opportunities in China and Asia. They are open-minded, but have a clear focus on personal development. Ultimately, applicants who have the mind-set to test themselves outside of their comfort zones go a long way in the admissions process. What career opportunities are emerging in China? Both entrepreneurship and digital career paths spring to mind. The school is very proud of its eLab, which has to date successfully incubated over 80 business ventures at different stages of development. The beauty of the Chinese economy is the combination of rapid disruption and scalability which opens doors for dynamic start-ups across multiple industries. High-tech has always been a popular career path for MBAs, and China is an exciting place right now given the globalization of China’s innovation champions such as Alibaba, Tencent and Xiaomi. How does CEIBS prepare students to maximize these opportunities? Over 80% of our MBA graduates successfully achieved a career switch in 2016. A lot of work is done by both the students and my colleagues behind-the-scenes in order to achieve such a high percentage. One unique aspect that contributes to our success is the Integrated China Strategy Project (ICSP), which throws MBAs into real-life consultancy projects with multinational corporations and globalizing Chinese enterprises, helping students to gain experience in a new industry, country or both. We also arrange numerous career treks and overseas electives in order to give our MBAs a first-hand look at cutting edge markets such as the tech scene in Shenzhen, Industry 4.0 in Germany, and globalizing Chinese enterprises in Nanjing. What changes and innovations lie ahead for CEIBS? As a management professor, I am extremely excited by the digital revolution in China, but also very partial to business frameworks. For me, we have a great platform but will continue to improve based on my vision of the three unique attributes of the CEIBS MBA: experiential, rigorous, and future-thinking. To give a concrete example, I see the MBA bringing in even more modules featuring the CEIBS Real Situation Learning Method, which brings case studies to life by enabling MBAs to engage directly with the company that is being examined. It’s a new challenge for me as well, and I will also take the opportunity to join the Gobi Desert Challenge with our MBAs this year to discover for myself the impact that a 112 kilometer team hike has on my leadership skills.